1994 rolls around, and the mostly forgotten Donkey Kong is given a new lease on life. 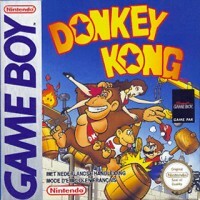 British developer Rare, who had created quite a few games by that time (R.C Pro Am and Battletoads, to namedrop two), worked with Nintendo and some very spiffy computer graphics software to craft a new adventure starring Donkey Kong. Featuring an interesting art style for the time and plenty of platforming and secrets to find, the game was a breakout hit. But a few months before that, another game featuring Donkey Kong had been released. Let's talk about Donkey Kong on the Game Boy, because it's pretty damn good. The title of this game is a bit confusing to most, as it's just "Donkey Kong". Lots of people, including myself, just call it "Donkey Kong '94" to reference that we mean this game that came out in 1994. So let's keep calling it that. Donkey Kong '94 is a deceptive game at first. You boot it up, and the game starts as what appears to be a remake of the 1981 arcade classic. That would have been a cruel ripoff, now wouldn't it? Shelling out 50 bucks for a portable version of a 1981 arcade game? Almost as bad as charging 25 bucks for one and then cutting out a whole stage! Surprise surprise, though, because it only LOOkS like it's a straight remake of the original. Once you knock DK onto his head.. why, he gets back up and steal the damsel in distress away! The chase is on! This is where the REAL meat of the game begins. Donkey Kong '94 is a puzzle platformer, featuring 96 levels spread out over 9 "worlds". As Mario, the object of every stage is to find an oversized key and take it to a large locked door. Sound easy? It both is and isn't. This game will end up throwing a whole lot of stuff at you, and some of the later levels will really have you using timing to your advantage. 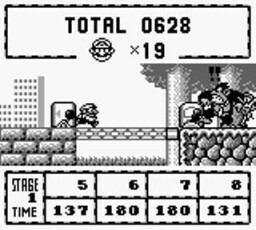 Generally, the game is pretty fair though, and little cutscenes occur after every four levels to teach you how to use the next stage gimmick, or a new trick for Mario. Speaking of Mr. Not-Plumber Man, he's actually got some interesting moves in this one. The most useful of these is the handstand, where he just flips over and starts walking on his hands. You can turn this into a double jump, or even a triple jump if you have good timing. What kind of tricks are in these levels? Aside from the enemies (most of which will kill Mario with but a touch), there can be any number of things. Environmental hazards like strong wind or water, mechanical things like switches or moving platforms, to platforms that you can create (but disappear very quickly!). Every stage is a test of both your platforming prowess and your thinking skills, and every fourth stage will have you facing Donkey Kong as he does a variety of things to attempt to kill you DEAD. You will die a lot, yes.. but it's doubtful you'll ever see the Game Over screen. Donkey Kong '94 isn't easy, but it is at the same time. The stages aren't exactly pushovers and will give you a bit of a run for your money.. but then there are the lives. See, in every non-DK showdown stage there's a parasol, purse, and hat to collect. Grab them all and you play a bonus game that guarantees you at least one extra life. These items are simple to get, and the rewards are simple to hit. Get these items regularly and you will never have to worry about your life count at all. As if that's not enough, after every four stages you get lives based on how fast you beat the levels; unless you're dawdling, that's at least four or five more lives right then and there. I played through the game recently for the first time in years, and I quickly maxed out my lives. They never dropped below 90 after that. You essentially have infinite tries if you play the game this way. All in all, Donkey Kong '94 is one of the best titles for the original Game Boy, if not a bit gimped by the ease at which you get lives. 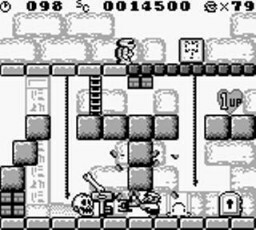 It's a must play for anyone who likes a little thinking to their platforming skill, and it'll keep you occupied for quite a while. Hell, it even has Super Game Boy support! Nothing like playing the game with a color palette on your TV with the original Donkey Kong arcade cabinet as the "frame".